Find hotel near Tiraz Widad Kawar Home Fo .. The western world may not have much of a concept of the diversity that is the Arabian garment. But the tradition of embroidering medieval Arabian garb and weaving inscriptions into textiles can tell a fascinating history. 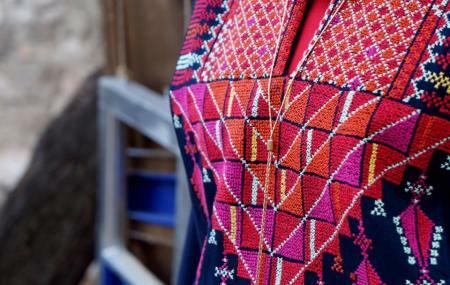 This election has 2000 items of clothes, textiles, jewelry, tools and materials, which focus on Palestinian and Jordanian costumes specifically but also on clothes from the rest of the Arab world. There is much to learn in the traditions of embroidery, Especially, when it comes to cultural matters such as affiliation and social structure. The specific purpose of the collector Widad Kawar is to preserve a culture torn apart by the conflicts of the 20th century. How popular is Tiraz Widad Kawar Home For Arab Dress? People normally club together Central Bank Of Jordan Currency Museum and Duke Of Mukhyber's Residence while planning their visit to Tiraz Widad Kawar Home For Arab Dress. Beautiful, interesting gallery of tradional clothes. Very rich and useful captions. Entrance fee: 2 JOD. An opportunity to comprehend a people, a civilization. I'm a big embroidery fan and there were lots of great explanations and beautiful samples. The English signs made every thing easy for me. It's fairly small but I spent a happy hour here then bought a rare embroidery book in the shop.